Why Did Artemis Prevent the Wind from Blowing? In Iphigenia at Aulis, Euripides describes how King Agamemnon sacrifices his daughter Iphigenia so the Greek forces can sail for Troy. The seer Calchas told Agamemnon that he must sacrifice his daughter to Artemis before the ships can sail, but Euripides does not explain why Artemis prevented the wind from blowing favorably in the first place. 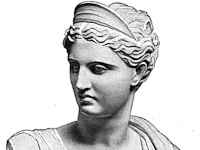 Accounts of the origins of Artemis' anger vary. Another account is given in the Agamemnon of Aeschylus. Here the elders of Argos recall the events of ten years ago when the Greeks set out to Troy (118). They remember the day at Aulis when Agamemnon and Menelaus watched as two eagles tore the unborn young from a pregnant hare. In Sophocles' Electra, Electra tells a different story (567). She says that while her father was hunting he startled a stag within Artemis' sanctuary. Agamemnon shot the stag with an arrow and made a boast about it, angering Artemis who demanded that Iphigenia be sacrificed as compensation.